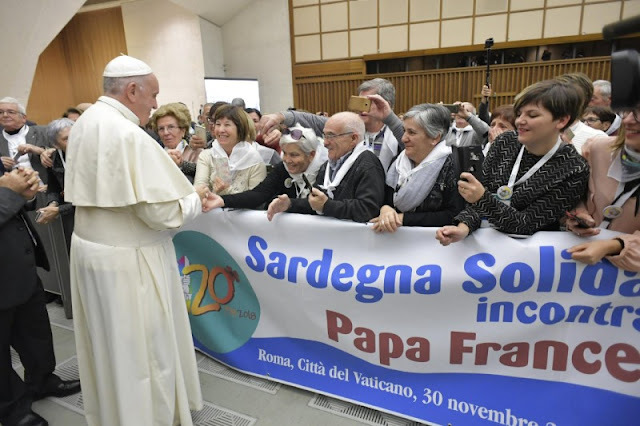 AT THE SERVICE CENTER FOR VOLUNTEERING "SOLIDARIAN SARDINIA"
I am pleased to meet with you, representatives of the Service Center for Volunteer Solidarity Sardinia, on the occasion of the 20th anniversary of its foundation, accompanied by Cardinal Angelo Becciu, together with the Archbishops of Cagliari, Mgr. Arrigo Miglio, and of Oristano, Mons Ignazio Sanna. To all I address my cordial greeting, with a deferential thought for the Authorities, in particular for the President of the Sardinia Region, Mr Francesco Pigliaru. I thank the president of Sardegna Solidale, Giampiero Farru, for the words with which he introduced this meeting. You represent the multitude of Sardinian volunteers, who work for a generous and necessary service to the last, in a territory - that of your beautiful island - rich in natural treasures, history and art, but also marked by poverty and unease. I would like to express my appreciation for what you have done and are working for the benefit of the weakest sections of the Sardinian population, with a focus on some of the poorest countries in the world. This should be emphasized, because it is a sign that you are not "isolated" but, despite the great needs of your home, you have kept open the horizon of your solidarity. In this perspective, you have been able to welcome and include those who have arrived in Sardinia from other lands in search of peace and work. Your associative reality gathers numerous voluntary organizations, carrying out a considerable service of aggregation and cooperation, aimed at making more qualified and effective the commitment in favor of those who are in precarious conditions. I encourage you to continue with a spirit of understanding and unity; in this way you will be able to spread the culture of solidarity more capillarily. In order to interpret the authentic needs of the people and find adequate responses to them, it is necessary to maintain an attitude of collaboration with the institutional realities of the territory: I am thinking in particular of the Municipalities and Parishes, who are daily close to the people sharing their labors and hopes. The culture of solidarity and gratuitousness qualifies volunteerism and concretely contributes to the construction of a fraternal society, at the center of which is the human person. In your land this culture draws abundantly from the strong Christian roots, that is, the love of God and the love of neighbor. Jesus, in the Gospel, invites us to love God with our whole heart and neighbor as ourselves (cf. Mk 12:29). It is the love of God that always makes us recognize the neighbor, the brother or sister to love. And this requires personal and voluntary commitment, for which public institutions can and must create favorable general conditions. Thanks to this evangelical "sap", help maintains its human dimension and is not depersonalized. Precisely for this reason you volunteers do not perform a work of substitution in the social network, but contribute to giving a human and Christian face to our society. The voluntary service of solidarity is a choice that makes free and open to the needs of the other; to the demands of justice, to the defense of life, to the protection of creation, with a tender and special attention for the sick and above all for the elderly, who are a treasure of wisdom! I encourage you to pursue your mission with passion, seeking all possible and constructive forms to awaken in public opinion the need to work for the common good, in support of the weak and the poor. Today there is a great need for witnesses of goodness, tenderness and gratuitous love. There is a need for persevering people, who face difficulties with a spirit of unity and always placing at the base of all their ultimate goal, that is, service to others. By doing so, you will continue to be a reference point and an example for Sardinia as a whole. May the Virgin Mary assist you and support you, which the Sardinian people venerate with love in so many shrines; you inspire strength and confidence in God to always be a gift to others. I warmly bless all of you and your loved ones, and I ask you to please pray for me. Thank you.